Hoodwinked over the Dorsey Drive interchange! Really? 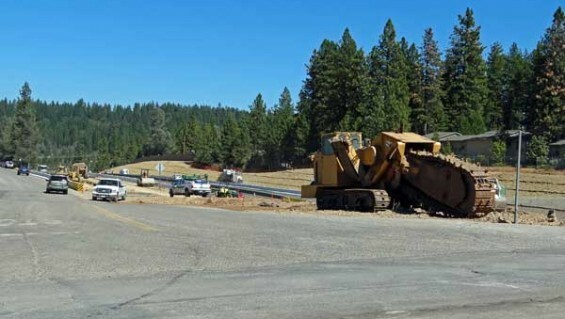 This week’s eruption over the mere concept of a shopping center on Dorsey Drive at Highway 49 in Grass Valley revealed that many people are apparently easily duped or hoodwinked by the silver-tongued smoothies on the Grass Valley City Council. Dorsey interchange: Pushing more than dirt? The proposal surfaces at a time when work on the long-awaited Dorsey Drive interchange is underway, a project that will add substantial value to undeveloped property in the area. This has prompted a lot of people to cry foul. The interchange was promoted as providing easier access to Sierra Nevada Memorial Hospital, Sierra College, and even Nevada Union High School. It apparently didn’t occur to a lot of people that owners might be encouraged to develop their vacant property. How were the people hoodwinked? Because the possibility of development didn’t occur to everybody? How were promoters of the interchange being evasive? I don’t recall anybody promising NOT to develop property if the interchange went in. Is access to the hospital not important if it means development of empty land? Other council members have remained silent to-date. Either they’re waiting for the sniper fire to subside, or they’re going to hold their counsel until they actually have a development proposal to vote on. Then we can proceed to the lawsuit. This entry was posted in Economy, Environment, Government, Politics, Public Policy and tagged Dorsey Drive interchange, Grass Valley development. Bookmark the permalink. 1 Response to Hoodwinked over the Dorsey Drive interchange! Really? I attended the Development Review Committee meeting. The committee made it clear that the project as submitted would have little chance of passing muster with the city. This isn’t going to happen overnight. There will be countless revisions before the first shovel full of dirt gets dug. I think people can stop hyperventilating and start thinking about what kind of development they want to see. To believe that that parcel will remain an empty manzanita patch is unrealistic.